A while back I saw some really cool pictures on Tumblr of what I found out to be Flash Tattoos, and I decided I had to order them! You can go to the website here, and check out all of the different ones that they have, and I highly recommend you do! These are such cool tattoos, and a certain percentage of the profits from each purchase goes towards different charities. So, you get sheets of really cool gold and silver tattoos and help out people at the same time! It was a win-win for me and I do not regret buying them! The tattoos come in sheets, and I chose the "Sheebani" one (you can find it here) which benefits the Miracle Foundation. I thought all of the henna inspired designs were so gorgeous, and there wasn't a tattoo I didn't like! The quote is "live. love. wander." I adore these elephants! I'm thinking I might use them for halloween somehow? Haha I'm really not sure yet. I love using these "bands" as bracelets and anklets. I cannot explain to you how difficult it was to photograph these haha. The gold and silver are very shiny and metallic-y, so it was very difficult to get a picture that didn't have a weird reflection. However, you can kind of see them in my OOTD picture from my VloggerFair Post: I have two on my chest, one on my right ankle, and one on the side of my arm that is of course covered with my cardigan. Overall, I really recommend buying these if you have a special event coming up, or if you just want to wear them anytime! They go on exactly like every other temporary tattoo, and come off easily with baby oil, or with gentle scrubbing with a rag or loofah in the shower. I got a lot of compliments and questions about them when I wore them, and some people even thought they were real! 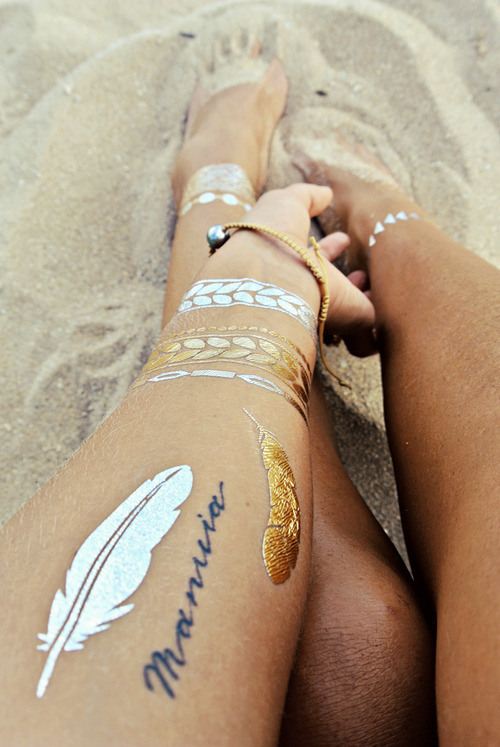 If it was actually possible to get real tattoos that looked like these, I would definitely get them in a heartbeat. They are so gorgeous but also subtle, so they are absolutely perfect in my book! Have you guys ever heard of Flash Tattoos? Me too! I definitely want to get those tattoos as well haha...I want them all!! Amazing post, these are amazing.Thanks for sharing. Thanks! I think they're pretty cool too! And I'll check out your blog! These look so pretty, and it's really good that they last a week as well! You did a super good job at photographing them, I can see how that would be a bit tricky! Haha thanks! I tried getting the lighting just right but gave up at the end haha. Nice Post ! Follow for Follow? Thanks! And I'll check out your blog! Yeah I really love them! And yeah I will check out your blog! I've seen those flash tattoos around a lot lately and really love how they look especially in pictures!